A simple synthetic method has been reported for the preparation of Ag nanoparticle loaded mesoporous γ-Al2O3. The synthesized materials were characterized by N2 adsorption-desorption analysis, X-ray diffraction, particle size analysis and high resolution transmission electron microscopy analysis. Antibacterial activity of Ag nanoparticle loaded γ-Al2O3 samples was investigated using Escherichia coli (E. coli) as model organism. Minimum Inhibitory Concentration (MIC) values for the synthesized samples were determined by tube dilution method using Mueller Hinton broth as medium. The Minimum Bactericidal Concentration (MBC) values of the samples were determined by plating out the MIC tube suspensions on nutrient agar plates. 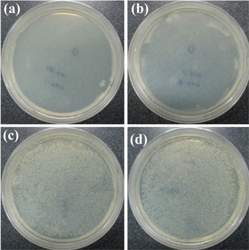 These results indicated that the synthesized materials exhibited very good antibacterial property.